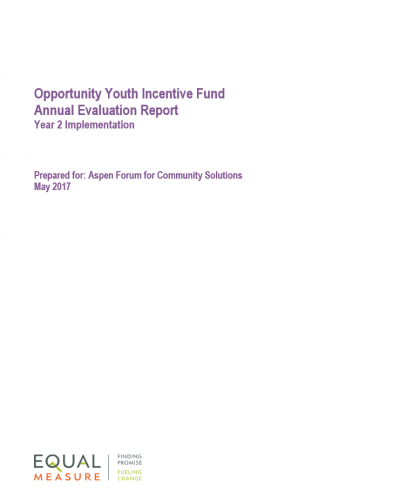 The Aspen Forum’s OYIF Annual Evaluation Report: Year Two Implementation study looks at progress across the 21 initial sites in our OYIF network. The independent evaluation, done by Equal Measure, provides information on progress from baseline year data collection across the OYIF. The goal of the OYIF is to support community collaboratives focused on building and deepening education and employment pathways for opportunity youth. ‘Opportunity Youth’ are 16-24 year olds who are neither connected to education nor jobs. There are 5 million such young people in the US, and the Aspen Forum’s network of sites has the potential to impact the local systems that reach 1.3 million, or over 25% of all opportunity youth in the United States. Public officials have joined the community collaboratives – up 43% points in one year — and more of them are speaking out on OY issues – up 23% points in one year. Additionally, equity is incredibly important in our work; young people of color are over-represented in the total numbers of opportunity youth. We’re pleased to report that 89% of the young adults in service delivery pilots across the 21 sites are people of color. Equal Measure has also identified six key barriers that hinder progress for communities working on behalf of opportunity youth, including: organizational (and systems) silos; financial constraints; and disconnected educational offerings, to name just a few. The full list of barriers, more indicators and data on progress, and more on the impressively quick successes of many collaboratives shifting local systems, is covered in the full report.